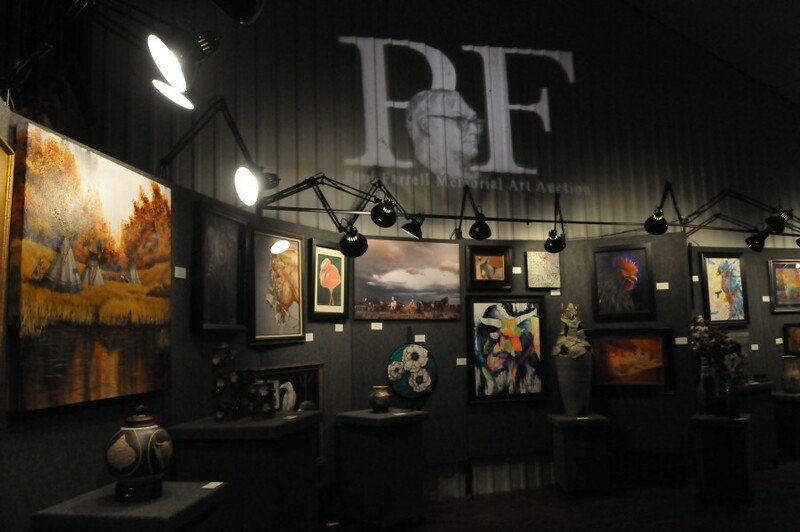 Goodwell, Okla. — The 19th annual Paul Farrell Memorial Art Auction happened Friday, March 1st with gusto, bringing in right around $50,000. Oklahoma Panhandle State University Art Department hosted the event at Pickle Creek Event center, complete with a steak dinner, live music, and silent and live auctions. The annual event started as a discussion among faculty and students many years ago. A local man and very talented artist named Paul Farrell had been painting, doing sculptures, and woodwork before being diagnosed with melanoma in one of his eyes. He ended up losing an eye and his wife encouraged him to take some courses at Panhandle State in an effort to regain some depth perception, a key tool for artists. He began taking classes and in his own quiet way would impart tidbits of wisdom to the students he was around. When he passed, a group of the students that had come to dearly love him gathered together and organized the Auction in his memory. The auction originally featured artwork from faculty and students at Panhandle State and has transformed into featuring the artwork of those students who graduate and want to continue to contribute to the event. Each year, a wide variety of work is submitted to a jury for the opportunity to be selected as an auction item. Pieces range from drawing and painting to photography, sculpture, ceramics, and encaustics. This year, the auction had 55 items up for sale. Additional items were available through the silent auction, an opportunity for younger, up and coming artists to display their work, and for others to donate smaller pieces. The highest selling piece “Buffalo Vessel” by Brent Shoulders was a ceramic vase with a black walnut lid and sculpted buffalo, and a steel base. The piece brought in a bid of $2,000. The money raised at the auction is split with 50 percent going to the artists and the other 50 percent is placed in various scholarships, awards, and departmental equipment expenses. For more information about the Paul Farrell Memorial Art Auction, find us on Facebook. To see the inner workings of the department, follow Panhandle State Art on Twitter and Instagram.